Always start with eggs at least two days old. 4 How Long After I Cook Hard-Boiled Eggs Are They Still Good to Eat? Hard-cooked eggs, commonly referred to as hard-boiled eggs, are often used in pasta salads, egg salad, tuna salad, deviled eggs and for healthy, high protein snacks or breakfast. However, for many people, hard-boiled eggs have the tendency to stick to their shells when peeled. There is a way to get around this sticky problem, assuming your eggs are at least two days old when you intend to boil them, as new eggs will not peel easily. Put 2 cups of ice in a large pan with a tight-fitting top. Add 2 eggs to the pan. Run enough cold tap water into the pan to cover the eggs by 1 inch. Cover the pan and allow the ice to melt, about 15 minutes. Bring the contents of the pan just to the boil. Immediately remove the pan from heat and cover with the lid. Let the eggs sit in the water to cook. 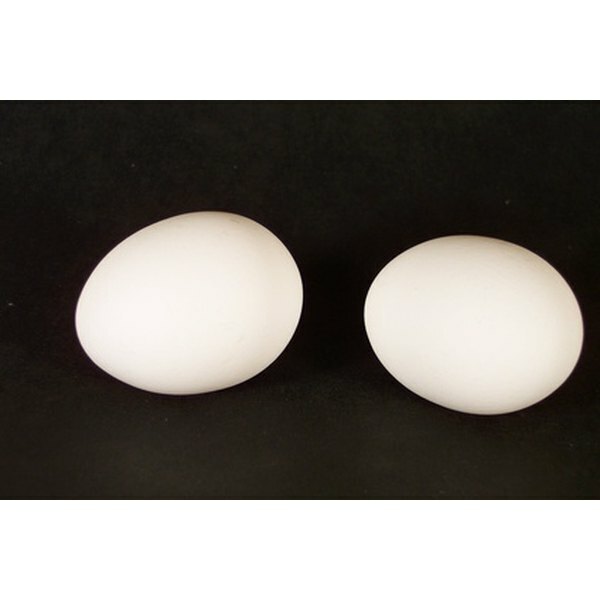 Medium-sized eggs should rest for 12 minutes; large eggs for 15, and extra large eggs should rest for 18 minutes. Do not remove the lid during this time. Remove the eggs from the pan with a slotted spoon. Put the remaining 2 cups of ice into the pan. Add the eggs to the pan and run enough cold water into the pan to cover the eggs by 1 inch. Allow the eggs to cool fully in the cold water, about 15 to 20 minutes. Crack one end of the egg, followed by the other end. The shell will come off in several large pieces when pried with your fingers. Hard-cooked eggs should be stored in the refrigerator for no more than five days. Eggs removed from their shells should be used with 24 hours, and stored in an airtight container in the refrigerator. If the first egg you peel doesn’t peel easily and is still warm inside, you can place the egg back inside the water until it cools. You can cook more than two eggs at once if you have a large enough pot or a stockpot. Simply multiply the ice by 1 cup per egg and cover the eggs with cold tap water. Adding table salt or white vinegar is a common remedy for keeping eggshells from sticking to the egg inside and to prevent breakage. Really, these tricks do very little. What Causes an Eggshell to Stick to a Boiled Egg?